Raise your hands if you were bummed out by Starz network’s decision to cancel Ash Vs Evil Dead after its third season. I, for one, was totally devastated. Starz, how could you! Sob, sob. Sniffle, sniffle. Bawl, bawl. Not groovy, not groovy at all. Now that Bruce Campbell has also announced he’s hanging up his chainsaw for good, I felt the time was right for a yarny tribute to our chainsaw-handed hero Ash J. Williams—portrayed by the charismatic Bruce Campbell—who has been fighting the terrors of the evil dead since 1981. So, in a true Ash fashion, I avoided all deadlines and responsibilities for a week to create this 8.5 inch amigurumi version of “jefe” Ash Williams. And because I want an amigurumi army of Ash J. Williams to colonize this planet, I wrote a pattern for it too. To join me in my mission, download this free pattern by clicking on the link at the end of this post, make as many Ash Willaims as you can, and gift them to your Ash Vs Evil Dead-loving friends and family. Yes, Jefe, we are working on it. It should be ready by the end of this post. So, about the amigurumi. It’s an intermediate level pattern that requires very small amounts of yarn. That’s the good news. The not-so-good news is, since the pattern has a lot of details, it requires a bit of sewing and embroidery skills, working with wires and wire cutters, and a whole lot of patience. …and wired arms, which means you can pose his arms at different angles and take super awesome photos like this. Oh, and the amigurumi can stand on its own without any support. Isn’t that sweet! Now download the free pattern, make your very own Ash Williams and save the world from the Deadites. If you liked this free pattern, would you please consider making a small donation to Animal Nepal? Animal Nepal is a not for profit, animal welfare and rights organization based in Lalitpur, Nepal, which runs two sanctuaries for abused and injured homeless/working animals. This organization is also in the forefront of campaigning for animal rights. If you want to see the wonderful work these folks do, you can check out their Facebook page or their blog. You can also help them by donating here. They say you make handmade gifts for those you love. Since I love reading, I decided I needed to make something for the device that lets me read at night without blinding me. 😉 Now that I’ve made two of them for my Kindle and can personally vouch for how handy this little sleeve is, I’m sharing this pattern with you. This crochet sleeve is designed for Kindle Paperwhite [7th generation] but the pattern can be adapted to fit other eReaders and tablets as well. Look up the section on sizing [under Special Notes] in the PDF to see how this can be done. If you liked this free amigurumi pattern, would you please consider making a small donation to Animal Nepal? Animal Nepal is a not for profit, animal welfare and rights organization based in Lalitpur, Nepal, which runs two sanctuaries for abused and injured homeless/working animals. This organization is also in the forefront of campaigning for animal rights. If you want to see the wonderful work these folks do, you can check out their Facebook page or their blog . You can also help them by donating here . With the Holiday season almost upon us, there are gifts to make for those on our “nice list” and handmade gift shops to stock. And there’s soooo little time. Keeping in mind the craziness of the season, I designed (what I think is) the perfect little bear, which uses the simplest of stitches, requires only small amounts of yarn to make, and demands very little of your time. What’s more, you can customize the colors to make it appropriate for any season. And the pattern is free! Made with sock weight yarn and a 2.5mm hook, these bears stand 3.5 inches tall (till the tip of their ears). Add the hat and the height comes up to approximately 5.5 inches. 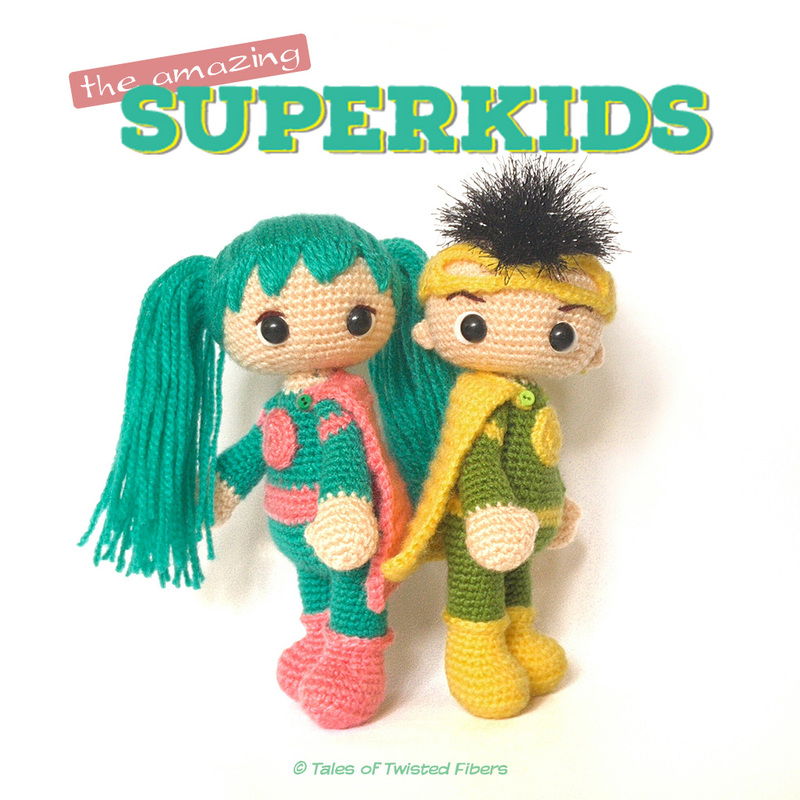 Because they are so quick and easy to make—and so very cute to look at if I say so myself, they’ll make great gifts for your amigurumi loving friends and family. You can even add a string on top and use these Lazy Bears as Christmas tree ornaments (if you are into big ornaments) or you can use a lighter weight yarn and make smaller versions of them. When made with thinner yarn or crochet thread, they will also make great charms for key rings and tote bags. I hope fellow crocheters who sell what they make and crocheters who hook for charity will love this pattern too because, as I pointed out earlier, it is a quick and easy pattern that requires very less craft resources. I hope you enjoy making these Lazy Bears as much as I enjoyed designing them for you. And I hope you’ll use your mad crochet skills to make a few of them as gifts because right now the world really needs hugs and teddy bears. P.S. I named them Lazy Bears not because they’re lazy but because I think they make a perfect project for lazy crocheters like me. 😛 Also because they were inspired by my two lazy furbabies, one of whom turned seven today. If you liked this free amigurumi pattern, would you please consider making a small donation to Animal Nepal? Animal Nepal is a not for profit, animal welfare and rights organization based in Lalitpur, Nepal, which runs two sanctuaries for abused and injured homeless/working animals. This organization is also in the forefront of campaigning for animal rights. If you want to see the wonderful work these folks do, you can check out their Facebook page or their blog. You can also help them by donating here. I have been featured as the (Knit &) Crochet Superstar on the UK based craft website Cut Out + Keep where, in an interview with its founder Cat Morley, I talk about my designs, my favorite knit and crochet toy designers, Animal Nepal, and how my first attempt at making an amigurumi went horribly wrong. You can read the interview here. From May 9 to 15, seven of my amigurumi patterns will be featured on the Cut Out + Keep Superstar section, one pattern a day. The first pattern featured today is Baby Bitsy. Visit Cut Out + Keep from Monday to Sunday to see all the featured patterns. Follow Cut Out + Keep on Facebook, Twitter or Instagram to keep up with all the amazing craft tutorials. Hello! Long time! I know I’ve not been posting much lately but you know how life tends to get in the way of crocheting. We’ve all been there. The struggle is real. 😉 This post is going to be short because I managed to get my right hand stuck between the jaws of an angry dog(!). Yeah, I know, I can be exceptionally good at being stupid but don’t worry, the dog is fine (and sleeping next to my desk as I type this). 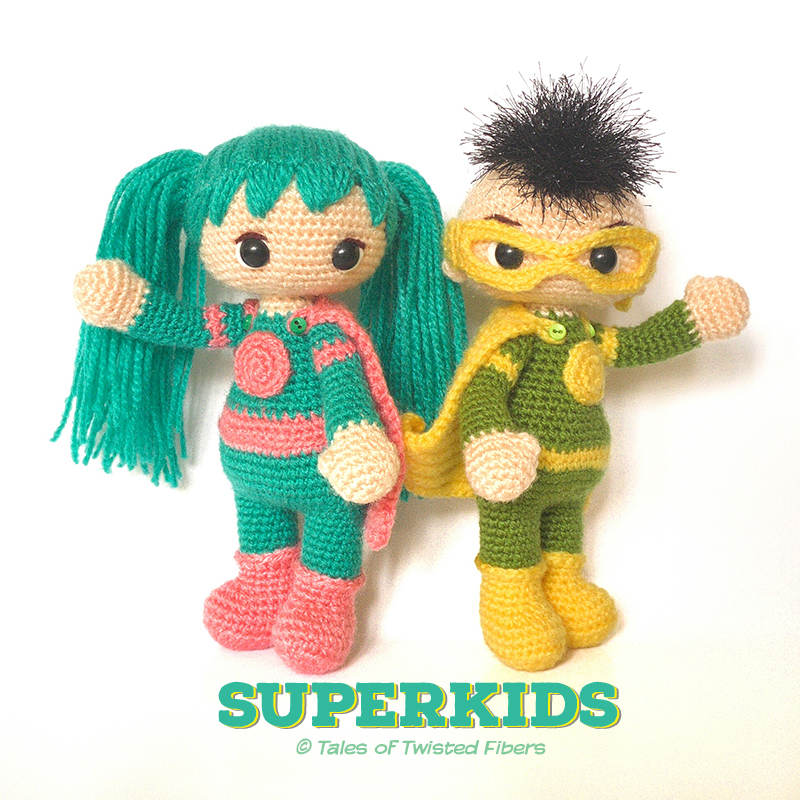 Made with sock weight yarn, this adorable crime fighting duo stand 8 inches tall and come with their own removable capes. Oh, and the boy has a cool eye mask. To download the pattern in DUTCH, translated by our fellow crocheter Nanske, click here. If you prefer to add the DUTCH version of this pattern to your Ravelry library, we’ve got that covered for you too! 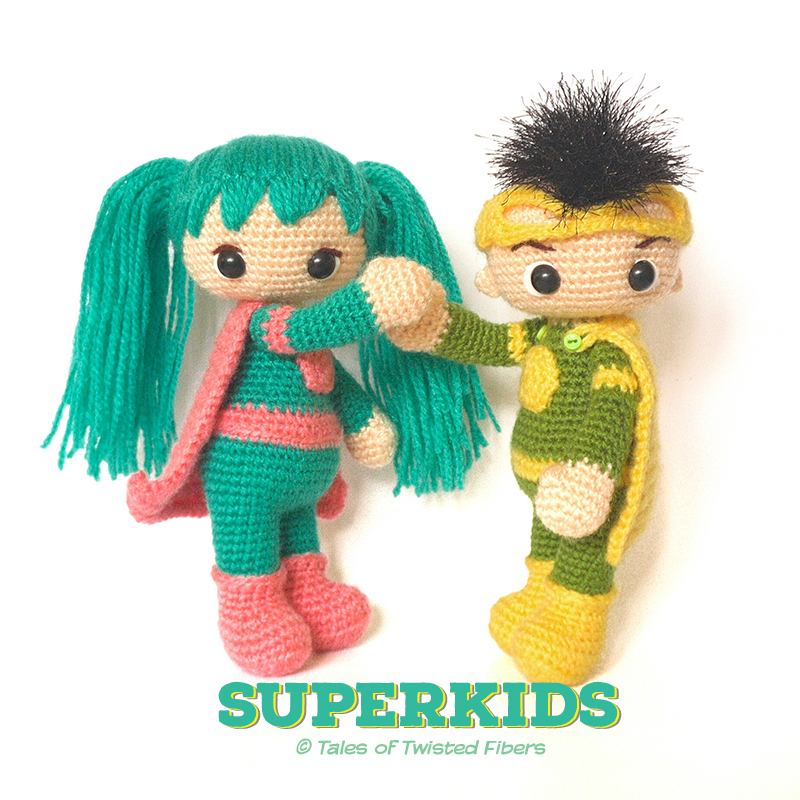 Amigurumi designer Amifan and I collaborated to bring you this Dutch edition of De verbazingwekkende SuperKids. How cool is that! 🙂 Click here to get this pattern. Would I be wrong to assume that most of you have already finished decorating your homes, ticked everything off your Holiday shopping list, wrapped the gifts, and are now proudly surveying your handiwork while enjoying a cup of delicious hot chocolate and counting down to Christmas? I, for one, have accomplished absolutely none of the above. Truth be told, my artificial Christmas tree is yet to be taken out of the storage, and I still need to figure out where the hell are those boxes containing all the bells and baubles. But I have a feeling I’m not the only one who leaves everything to be done at the eleventh nerve-wracking hour. So in honor of all those late Kates who’re yet to dust off their Christmas ornaments, whose homes still don’t look like something straight out of a Holiday special magazine spread, those toiling to get their handmade Christmas gifts ready (or at least are toying with the idea of making a handmade gift or two), I present to you Pucci, your personal Holiday assistant. Though her resume says she’s a highly skilled personal holiday assistant, I’m not exactly sure how much help an 8 inch amigurumi can be. All I can say is that she will make your Holiday photos look good. To download the pattern in DUTCH, translated by our fellow crocheter Jeannette Kemp, click here. 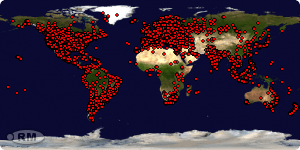 To get the pattern in GERMAN, visit Gabi Donner’s blog here. Thanks for translating the pattern, Gabi. P.S. The pattern was designed and written in a hurry so it is possible it may contain some errors. If you spot any, would you please be kind enough to let me know? P.S.S. I used loop stitch to make Pucci’s hair. If you’re unfamiliar with this stitch, here’s an excellent photo tutorial by Stacey of Fresh Stitches.